What did you think about your study abroad program? Do you want to go abroad again? I loved, loved, loved my study abroad program. 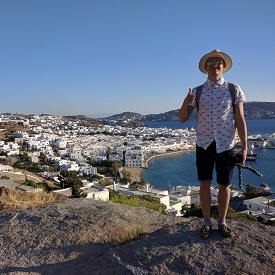 We were on a small island in Greece, called Paros, for three weeks, and any ideas you may have right now of what that's like are probably true. It really was paradise. It was eighty degrees and did not rain once the entire time we were there; everyday felt absolutely wonderful. Culturally, it is hard to express how different it was from Indianapolis. It sounds cliché, but everything really was "slower," and I loved that. The city was walkable for the most part, meaning you could only get around by foot or scooter. Having a car was almost an annoyance. Upset faces, someone in a hurry, or a rude individual were rare to find. Everyone and everything was relaxed. I mean why wouldn't you be relaxed if you lived in paradise? Nearly every business was family owned and treated its customers with actual care and respect. Food was fresh and natural. Sun set over the Mediterranean. All was well. What did you do for your program? Over the course of the three weeks, each student created a documentary covering the life of a local we chose. I chose a beekeeping couple named Thalia and Agapios for my personal documentary, in which I wrote questions for, shot, and edited. All of the students were also split into two groups, in which each group made a larger scale documentary. This meant we all worked on two documentaries each during our stay. My group's documentary covered what was called the "Kastro", while the other group covered an ancient cemetery. We had class nearly everyday from 10am to 2pm, then often had the rest of the day to do whatever we pleased. 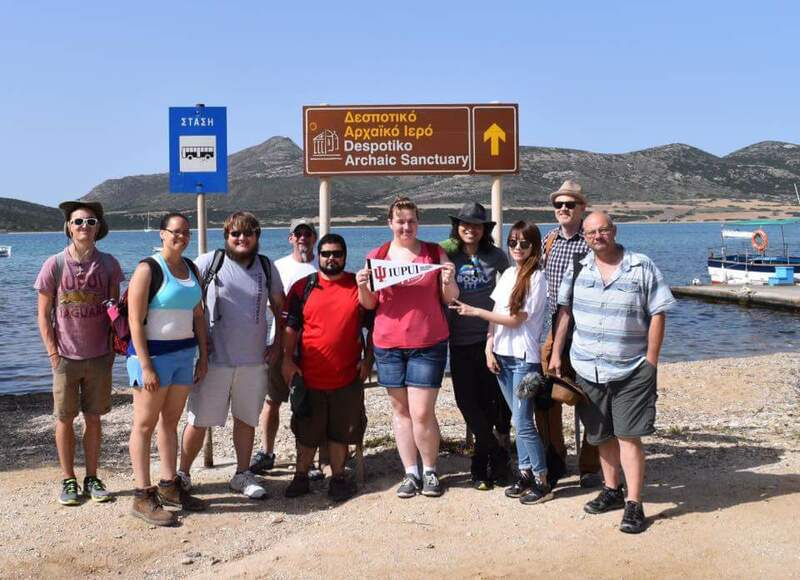 As a whole, we often took trips to various parts of the island to learn and explore, such as museums and even marble caves (Parian marble is the finest in the world). My study abroad experience made me much more thankful for IUPUI and the opportunities it provides. It truly cares for the success and bettering of its students. If I didn't choose to go here, simply put, my opportunity never would have come. 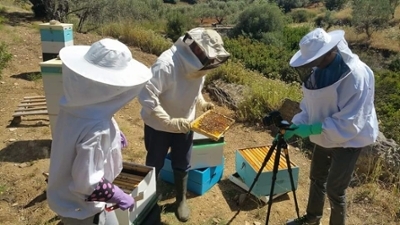 Probably my best memory from my time abroad was going into the mountains of Paros with the local beekeeping couple I interviewed for my documentary. My friend Daniel and I (Daniel wanted to come along and help) woke up early in the morning and walked to a local restaurant where we were picked up by the couple. Where we stayed was along the water, so we drove in a pretty beat up van from there into the middle of the island. There were only front seats, so Daniel and Thalia sat on the metal floor in the back and, needless to say, felt every bump. The twenty-minute ride ended with us driving through hidden paths at a 45-degree angle down to the pit of mountains; this is where they kept their hives. Olive trees and fresh herbs surrounded us. The feeling was unlike any I have felt before. Eventually after multiple attempted locations, we set up camera under an olive tree to get as much even light as possible. Once the interview was finished, it was time to shoot B-roll footage of the couple tending their hives. For this, Daniel and I were given full bee suits to wear to avoid being stung. After about twenty minutes of shooting, Thalia cut out a piece of the honeycomb for us to try and we packed up to leave. Honey on Paros is generally thyme honey, as wild thyme was growing everywhere; back home, we mainly have clover honey that tastes very different, and so the Paros honey was like no honey I had tasted before, because, quite literally, I hadn't. understanding of the Greek language. We walked around for nearly an hour searching for a WiFi connection in order to locate the next correct bus. After rapid texting, calling, and freaking out in fear of missing our ferry, eventually we found the correct bus stop (which just so happened to be across the street from where we started), bought our ferry ticket, and boarded with a few minutes to spare. Even from being lost I gained plenty of experience. 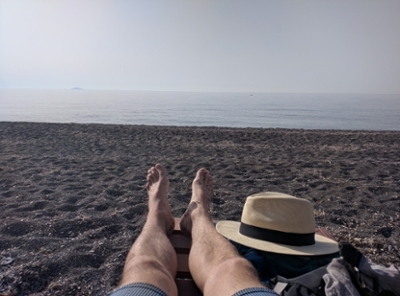 I learned what life in the suburbs of Athens was like, how to take their public transit, and I successfully problem solved my way out of a difficult situation 3,000 miles from home. Always find the good in the bad and learn from your experiences. Second off, if you can afford it, TRAVEL AFTER. By traveling after I experienced three new countries and probably ten new cultures. Traveling after really isn't as expensive as you may think, either. The average plane/train ticket to new cities was around $50 each, the hostels (hostels are amazing) cost around $20 a night, and food wasn't any more expensive. Traveling after, rather than flying all the way home and all the way back some other time, saves you time and money. I recommend visiting places different from what you are used to. It provides insight on what the rest of the world lives like. Lastly, plenty of financial aid is available. If you were to travel outside of school, not so much. I won two scholarships totaling $3000. My $2000 scholarship was awarded to two students because only another girl and I applied, so we both won. Scholarships like that are everywhere if you know how to find them. Another aspect to consider is that programs count as college credit. I obtained three credits towards my degree through my program, so that is just another benefit from studying abroad. Before my study abroad experience, I really had no first-hand experience of the world outside of urban America. I didn't actually know what it was like in Greece or Italy or Switzerland or Spain or Portugal (I traveled after my program). All I knew was fast paced, modern, materialistic America. What I gained is immeasurable. First off, not everyone cares about America. I have been taught my whole life that America is the best country in the world, so why wouldn't anyone want to live here, right? Well not really. I really wanted to know what the world thought of us, aside from our presidency, and I asked multiple people if they ever wanted to visit America. I was surprised at how many people just didn't care. And those who did care only cared, or even knew about, two places: New York City and Los Angeles. Each country is great in its own way. America isn't the best at everything. For better scenery? Greece. For a healthier, laid back style of living? Italy. For better chocolate? Switzerland. I had never really experienced true culture before, meaning I couldn't truly understand it. The places that were the least advanced technologically had the happiest individuals. They weren't sitting on phones or computers 24/7. They were talking with each other, taking in the views, and just enjoying their lives. Yes, America is the greatest country in the world to me, but not for everyone. I learned that I absolutely love traveling and meeting strangers from other cultures. I mean, I love it. Every day I would wake up and look forward to every single thing the day brought. I'd talk to strangers, which I don't do but wish I did. I would walk for an hour just exploring. Exploring. That's another activity I learned I love. 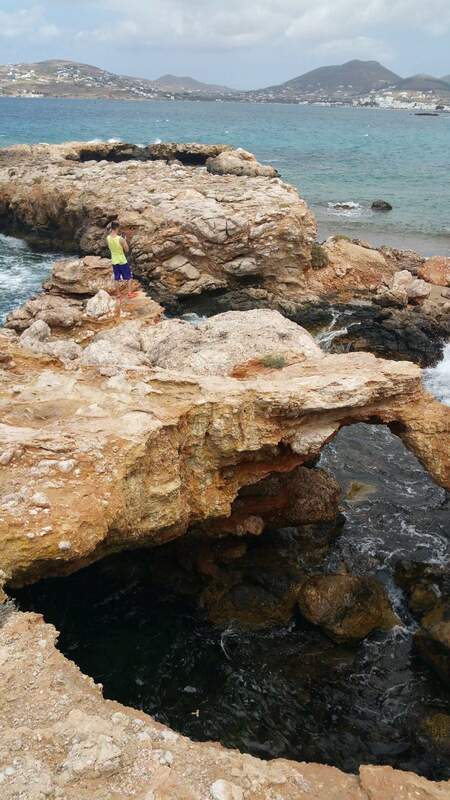 A few times, I went on a two-hour hike/run just exploring and discovering various cliffs and mini-caves around the island. In other cities, I'd walk up and down every street looking for something new and interesting. This trip brought out my love of exploration, traveling, and experiencing other cultures, something I'll be eternally thankful for.